Over the past 24 hours we have seen Harvey be downgraded from a Category 4 to a Category 1 Hurricane as is it continues to slowly (6 MPH) move in a north northwesterly direction. There has been really no changes to the track with the forecasts still showing Harvey will remain overhead at least through Thursday. Harvey could remain a Hurricane until Sunday and then become a Tropical Storm through Wednesday. Over the past 24 hours, the District has received between 7 to 9 inches of rain. This has created a rise in the District’s lake system and is currently draining out through the District’s gravity outfall at Alcorn Lake. Based on the forecasts, the District could still see severe rainfall, between 15 to 20 inches over the 3 to 5 days. 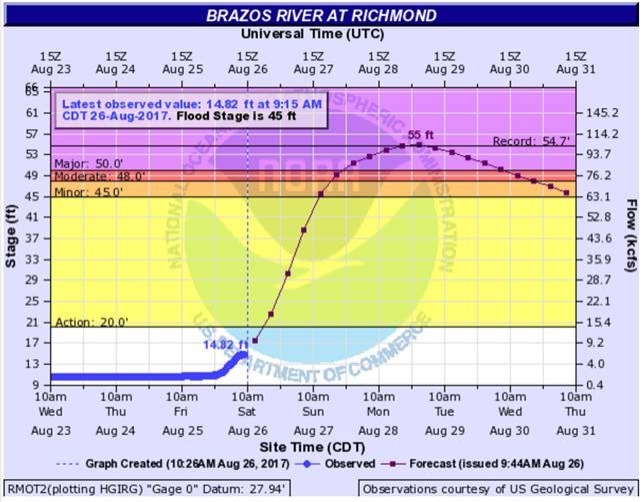 Due to the amount of rain that has been predicted, the National Weather Service has issued a flood forecast for the Brazos River in Richmond. As of 9:44 AM, the forecast showed the Brazos River hitting a Gage Elevation of 55.0’ on Monday Evening or into Tuesday Morning. For reference, this is about 6 inches higher than the May 2016 Record Flood. With this forecast, the District could see similar water levels along the levee that we experienced during last year’s record flood. Based on our inspections this morning and our on-going maintenance activities, the levee system is in good shape and we will have several feet of freeboard at this forecasted elevation. As the water rises, the District will continue to perform periodic inspections several times each day over the next week or longer if needed. Assuming the river rises as anticipated, the water surface elevations in the lakes will increase as we experience additional rain over the next week. Please note that the District’s lake system and pump station were designed based on the conditions of having an internal rain event when Brazos River is up. This is referred to as a coincidentally storm event. The District will be monitoring the situation and could transition its efforts to a 24/7 operation later today as a precautionary measure in the event we get more rain while the Brazos River rises. Please remember that this a precautionary measure and are not a sign of trouble. These measures are part of our flood response plan as outlined in the District’s Emergency Action Plan. Please continue to visit the District’s website for more information. As of noon today, Harvey has been upgraded to a Category 1 Hurricane with maximum sustained winds of 85 MPH. 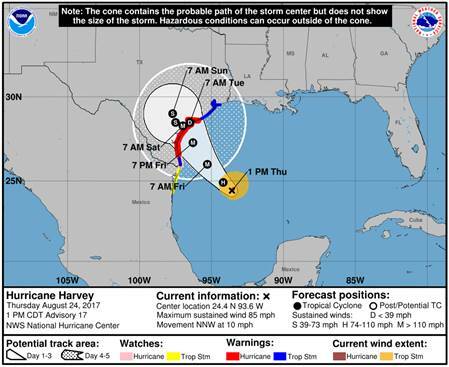 As shown on the forecast, Harvey will continue to move in a northwesterly direction making landfall early Saturday morning. Harvey will continue to strengthen and is predicted to hit landfill as a Category 3 Hurricane with maximum sustained winds of 125 MPH. Before the storm, please remember to secure any outdoor items that could be impacted by winds. Any items left outside could become projectiles causing damage to homes or even injury to people. After the storm, be very cautious when removing debris and watch out for hidden dangers. Some of these hidden dangers include downed power lines that may still be energized or tree limbs that were damaged and could fall long after the storm passes. To learn more about Hurricane Preparedness, visit https://www.ready.gov/hurricanes. Fort Bend County is currently under a Tropical Storm Warming, but at this time there are no active flood warnings for the Brazos River. District will continue to coordinate with the City of Sugar Land, Fort Bend County, and the National Weather Service and provide updates as necessary.